The order also indefinitely bars Syrian refugees from entering the U.S. 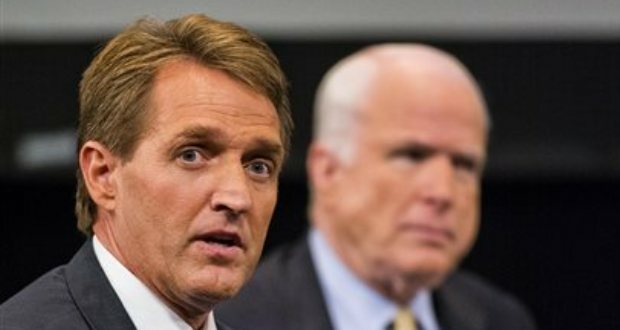 In separate statements, U.S. John McCain and U.S. Sen. Jeff Flake called Trump’s order a “self-inflicted wound in the fight against terrorism” and “unacceptable,” respectively. “We should not stop green-card holders from returning to the country they call home. We should not stop those who have served as interpreters for our military and diplomats from seeking refuge in the country they risked their lives to help. And we should not turn our backs on those refugees who have been shown through extensive vetting to pose no demonstrable threat to our nation, and who have suffered unspeakable horrors, most of them women and children,” the duo said. The executive order bars entry for the next three months of citizens from Iraq, Syria, Iran, Sudan, Libya, Somalia and Yemen. As the order went into effect, confusion at international airports ensued as the U.S. Department of Homeland Security enforced the policy. The White House later clarified that Green Card holders from the affected countries will undergo additional screening, but will otherwise be allowed to return to the U.S. The American Civil Liberties Union swiftly challenged the order and won a temporary victory when a federal judge in New York issued a stay, saying authorities may not remove affected immigrants who had already arrived in US airports. Protests against the ban also erupted at international airports across the nation. “This executive order sends a signal, intended or not, that America does not want Muslims coming into our country. That is why we fear this executive order may do more to help terrorist recruitment than improve our security,” McCain and Graham said. So far, only Rep. Trent Franks, who represents Arizona’s 8th Congressional District, and Andy Biggs, who represents the state’s 5th Congressional District, have embraced Trump’s executive order. Later, Rep. Martha McSally, who represents Arizona’s 2nd Congressional District, said she serves on a Congressional task force focused on combating ISIS that has found “very real and dangerous gaps” in the U.S. vetting processes and noted “vulnerabilities” expressed by intelligence officials. Others Republican members of Arizona’s House delegation have remained silent. “Once the implementation has been smoothed out, the Executive Order will ultimately ensure those who want to come to America, those who respect and share our values, will find a welcome refuge through ‘the golden door,’” Franks said. “Those tired, poor, and huddled masses, those homeless and tempest-tossed, who are willing to respect our Constitution and way of life, will be granted asylum and maybe even a new home. Those who wish to do us harm or who despise the values which make us great will no longer be naively welcomed with open arms,” he said. Franks’ spokeswoman, Destiny Edwards, said the congressman does not want to see Green Card holders denied entry back to the U.S.
Biggs also embraced Trump’s order, citing the growth of “radical Islamic” terrorism and how that has changed the dangers facing the world. Following the attacks on September 11 and other terrorist acts from around the world, vetting immigrants to ensure they pose no security threat “has never been higher,” he said. “While President Trump’s order needs clarification and Congressional oversight, it is within his constitutional authority and fulfills a need for stricter vetting of immigrants,” Biggs said, adding this is what Trump promised during the campaign. Democrats, on the other hand, immediately decried the order. “We do not turn our backs on families and children fleeing persecution, genocide, and war. They come to the U.S., they come to Arizona, for the same reasons our forefathers did – to live in a land of freedom, liberty and justice for all,” she said. The White House is sticking by the order, and Trump took to Twitter to hit back at McCain and others who have criticized it. Many thanks and much admiration to our two senators from Arizona. My maternal grandparents immigrated from Lebanon in 1895, Probably would not have happened if the Trumpster was leading the country back then. Flake is only in it for the H1-B visa related campaign donations. A total sell out of Arizona’s security in favor of his donor’s interests. He has been pushing the H1-B visa program ever since the week he was re-elected. A program that brings in a lot of middle eastern tech workers and has been known for abuse. The President of the United States was hired and elected to safeguard our nation and serve the people. He was not hired to criticize and oppress the rights of our citizens to free assembly, freedom of speech, freedom of the press, freedom of religion and our voting rights. We are a free people and do not want to be controlled by one elected ruler or a group of controlling people. The President and government work for us. Do not forget that. We will fight for our rights and freedoms and will fight against oppression. This fight for freedom will never divide us as Americans, it will unite us. Thank you Senator McCain and Senator Flake for standing up to what is coming to look like a form of tyranny in practice. Oppressing people because they do not agree with the President is not right.